Throughout the month of August, watching the results of the polls of Donald Trump against Hillary Clinton has been the equivalent of watching the results of a race between a drunk and exceptionally distracted sloth against a slightly injured but still high-functioning cheetah. 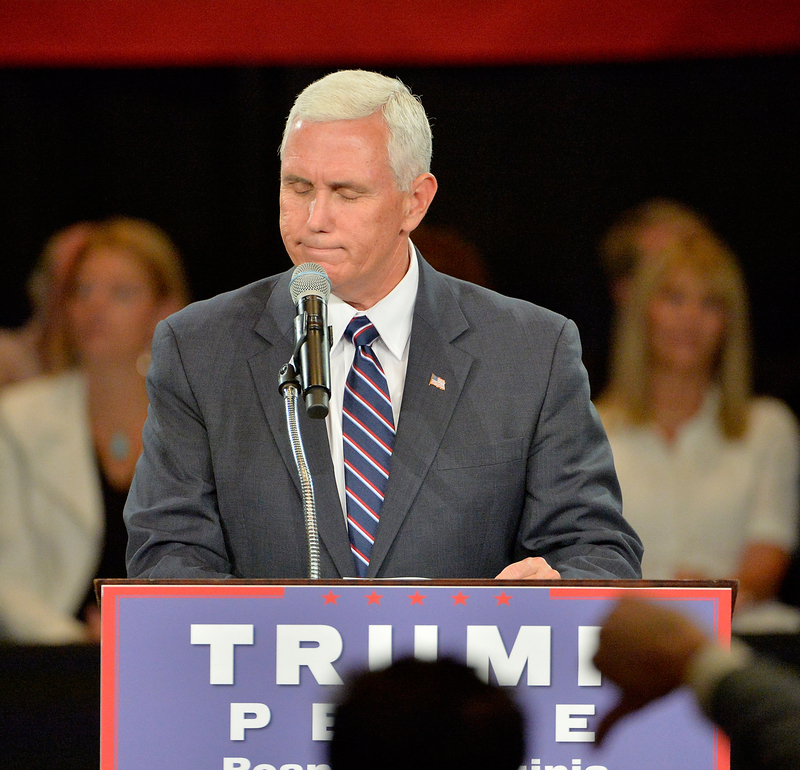 But while the focus is on Trump, how is Republican vice presidential nominee Mike Pence handling what Sen. Ben Sasse would, perhaps, simply call a "dumpster fire" of a campaign? I imagined the kind of pep talk the Indiana governor gives to himself each morning. You can do this, Big Mike. You've got this. One foot in front of the other, as Karen reminds you. It's really not so bad. Smile, shake hands, nod. Smile, shake hands, nod. Meet Republican colleagues who formerly held you in his esteem and beg them to offer up lukewarm, rehashed statements of endorsements for a man whose foreign policy knowledge makes Sarah Palin seem like Dwight Eisenhower — a man who, in the best case scenario, will be my boss for the next four years. Meet with seniors in Columbus, Indiana, on Aug. 13. Eat better-than-expected chili in Cincinnati on Aug. 6. Swallow hard so the good folks of Ohio can't tell you're crying on the inside, Mikey. That was actually a pretty good day, as far as August has been. The only thing that mouth-breathing butthead did was accuse Hillary Clinton of being "brainwashed" and mentally unfit for the presidency. Nope, not too bad for Trump-Pence at all. Smile, shake hands, nod. Flinch and nod extra thoughtfully when asked about Trump's refusal to release his tax returns/insulting of a Gold Star family/accusing the president of founding ISIS. Pause. Attempt to translate Trump's words and justify them by saying something wholly different from what that man who's obsessed with muttering "You're fired" and doing a slight diving motion with his hand and wrist actually said, things like "Donald Trump has a way of talking to get people's attention, and it's drawn attention to a very important issue," or, “Look, he’s not someone that spent a lifetime in politics. He speaks his heart and he speaks his mind." If only his mind weren't so far up his rear end. Remember how badly you wanted this? You gave up running for another term as governor of your beloved Indiana? People respected you, even though you supported anti-LGBT "Religious Freedom" legislation and sought to make abortions of fetuses with disabilities illegal. But you wanted to be Trump's VP so badly that you were willing to give it up. You knew you couldn't run for governor and be on the Trump ticket, so you made your choice. And gosh darnit, you're gonna make the best of it. Sure, it's easy to forget why you even wanted to be associated with Trump in the first place when the man suggests people should assassinate Clinton, and George W. Bush's CIA director even says he's a "clear and present danger." But then remember how Chris Christie gives you the stink eye and begrudgingly asks "want anything?" when he gets Trump's McFlurry. Keep Christie's desperate yearning in mind when you make the cable news rounds and time and again and have to say of course, you have faith in Trump; you just have "different styles." Remember to say it's great that Trump has tapped Breitbart's Steve Bannon to be the new campaign CEO. Even though that means this campaign will run with less foresight and class than if five adolescent boys making fart jokes had been picked out of a random junior high bathroom in Kokomo, Indiana. Remember to keep adding "Make America Great Again" to your tweets. That will show sufficient support for this campaign, which has become the equivalent of a 12-car-pileup to my political career. Right? Right.